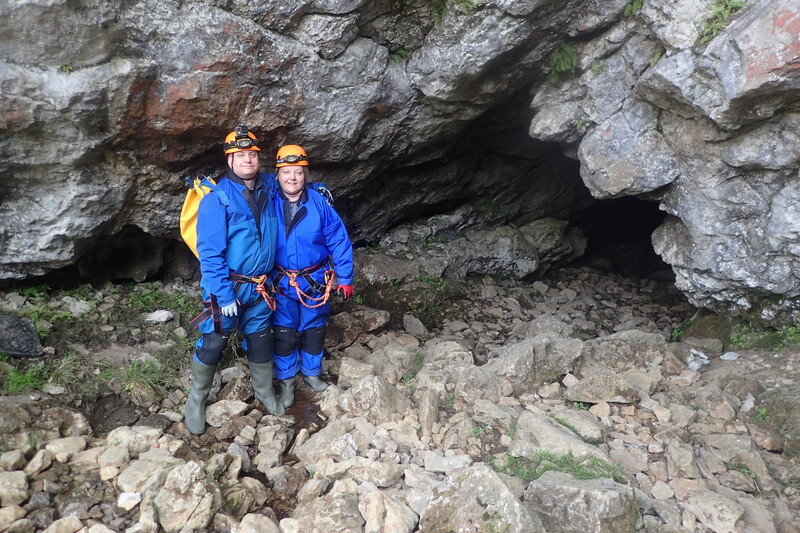 We’ve been beginners caving in the Peak District and its been ace! I’ve been accused in the past of being a cave dwelling uneducated troglodyte, so what better way to live up to that name and actually go caving. It’s time to descend into the abyss, go below in to the bowels of the planet, we’re going underground with beginner’s caving in the Peak District. Call it what you like, Potholing, Spelunking or Caving, either way, I get the feeling I might get stuck between a rock and a hard place. I’m not the smallest of fellas, and the last thing anyone wants is to be stuck in a rut. 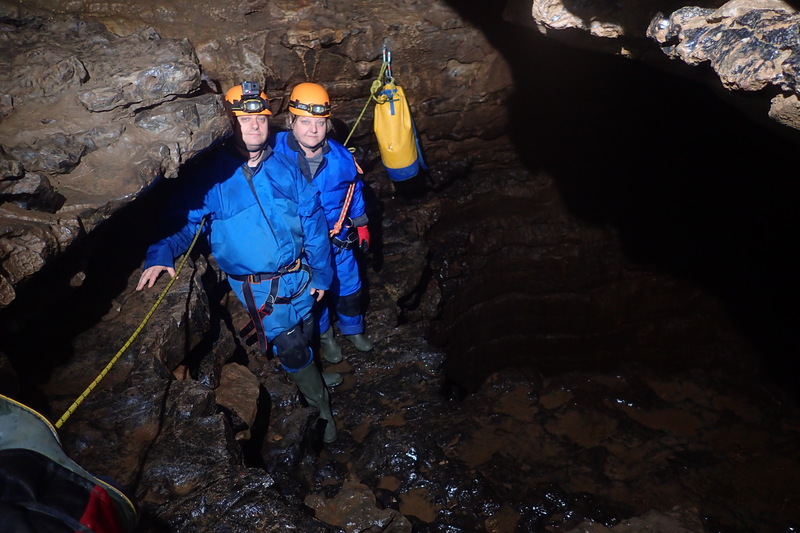 We’ve been to show caves like Speedwell and Peak Caverns and Ice Age Rock Art Caves at Creswell Crags but this half day caving experience in the Peak District will scratch beneath the surface. A collection of scrambles, squeezes, short climbs and hopefully not too many struggles. I’ll be lucky if I don’t get strangled by Mrs C though. The entrance to the cave isn’t a secret but it’s not advertised that widely either, suffice to say we rendezvous at a location in the Peak District before we take a short drive to Giant’s Hole cave. We’re then kitted out in wellies, overalls, hard hat and a head torch, prepared to get deep down and dirty. The weather is boiling so it feels a little strange dressed up in thermal leggings and fleece in this weather. But we’re going underground where the Castleton caves are certainly cooler and chillier and pretty much a constant climate. We follow a stream from the cave entrance at Giant’s Hole with a few twists and turn, some crawling and crab walking, squeezing sideways and stooping, we rest up at Base Camp chamber with its 11 metre high walls. We try a little climbing in this chamber on to the ledge. The walls are high, and a constant slow drip over thousands of years has produced a small finger size hole in the floor. Also in here is a nice squeeze if you are small and slim but that’s definitely not me. Without our head lamps, its pitch black and a total absence of light, you should really try it. Venturing further on we come to Boss Aven chamber with an impressive flowstone cascade 15 metres high before we get to our end point of Garlands Pot, a 7 metre deep pothole normally flowing with lots of water but due to Britain’s unusual dry spell its a smaller stream that sprays over the side. We hung over the side on the edge, staring into the pit of eternal doom to find our own faces staring back at us….. only kidding. 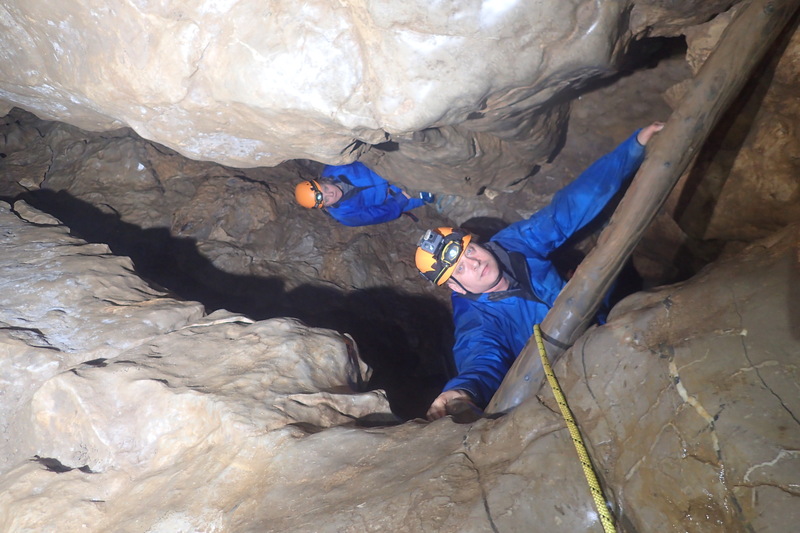 Our caving and potholing experience has been a blast, it’s a different world with layers of limestone and lava basalt bedrock, stalactites and stalagmites, and sea floor fossils (Crinoids) from thousands of years ago. It should be obvious to say that caving can be dangerous and sometimes fatal, and I’m not talking about the plot of The Descent. One person unfortunately passed away in this cave, so you should always go with someone who knows what they are doing. Our beginner’s caving in the Peak District is with Pete Knight from Peak Instruction who’s been informative an led us through today. He’s also taken these great photographs, thanks Pete, it’s been hard work and we’re sweating buckets but we’ve had a super time and suspect we’ll be back.